I’m sure you read my title and are asking yourself, what the heck is a Healthy Food Advocate? I know the first time I saw that title, I said the same thing. But, when I read those words, something rang in my head and said…This is YOU! In case you were wondering, a Healthy Food Advocate is someone who “Votes with their fork.” Meaning, they make food choices with a conscience by supporting local businesses and farmers, shopping locally, buying and eating according to what they believe is right as well as speaking out about laws and legislation that could affect the foods they eat. All of those are really who I am and want to be when it comes to making healthy food choices for myself and my family. But, I had to take food advocacy to the next level when I started to see articles written about how unhealthy gluten-free eating is. Over seven years ago when I started on my gluten-free journey, no one knew what the term gluten-free meant. I had to explain to everyone I came in contact with (including my friends and family) what it entailed and why I had to be so strict about what I ate. Then the book Wheat Belly, by Dr. William Davis, came on the market and people started to hear the term gluten-free in magazines and in the news. It went from being a medical necessity to a weight loss fad diet in a very short period of time. With all the press, the gluten-free pre-packaged food market surged and new products came on the grocery store shelves daily. It was a double-edged sword for people like me who needed to eat this way to stay healthy. On one hand, there were so many convenient food replacements available to choose from, but on the other hand the fad took the name gluten-free and made it less medically serious. Now that the fad is dying out, and people are moving on to a more Paleo way of eating (a diet based on the types of foods presumed to have been eaten by early humans, consisting chiefly of meat, fish, vegetables, and fruit, and excluding dairy or grain products and processed food), articles are now being written that say gluten-free foods are not healthy. To be clear, I agree that eating a diet consisting of only pre-packaged products (gluten-free or not) is not a healthy way for anyone to eat. My goal as a Gluten-Free Healthy Food Advocate is to take back the name gluten-free as a term only used for people who medically require it and educate people that gluten-free eating is not an unhealthy fad, but rather a way for people to safely consume naturally gluten-free foods to heal their damaged digestive system. I’m always amazed at people’s reaction when I tell them that I am gluten-free now compared to seven years ago. Lots of people roll their eyes in disbelief and many others uncomfortably explain that they’ve been meaning to go gluten-free or that they eat gluten-free some of the time (probably to keep up with the fad). Eating gluten-free only becomes necessary if you categorize yourself into one of the three medical designations below. No one should give-up eating gluten without first being tested for Celiac as you cannot get an accurate blood test result unless you are actively eating gluten. I made that mistake and gave-up eating gluten after years of being sick (intestinal bleeding, focus and attention problems, anxiety, bladder infections, chronic sore throats, infertility, weight fluctuations, migraines, depression, arthritic pain, various autoimmune conditions, etc.) that no one associated with the food I was eating. Years of antibiotics and overuse of NSAID’s  probably ruined my gut flora, but all I knew when I started to feel better after removing gluten, was that I wasn’t going to start eating it again to get the blood test. So sadly I will never know if I have Celiac Disease. Now my goal is to be an advocate for other gluten-free food eaters. I wrote my book 3 Steps to Gluten-Free Living to save people time and money after diagnosis of a gluten related disorder. By understanding what needs to be eliminated from the diet, how to transition emotionally and physically away from gluten and names of convenient pre-packaged gluten-free items to substitute back into your pantry, anyone can adapt a healthy gluten-free diet quickly and easily. The book stresses keeping balance in your life by choosing fresh ingredients to eat alongside convenient products. By choosing whole, clean, local, seasonal and organic foods (fruits, vegetables, dairy and meats), and combining them with convenient pre-packaged products, anyone required to eat gluten-free can find balance and enjoy a healthy gluten-free diet. For example, eating a brown rice and quinoa cracker with some local cheese or buying some red pepper hummus with some fresh seasonal vegetables is a perfect way to achieve that healthy balance. My Gluten-Free Food Advocacy has taken me all over to do food demonstrations and talks about how to adapt a healthy gluten-free diet. I am passionate about the subject of eating locally and seasonally and seek out reporters who try to debunk gluten-free eating as a fad and unhealthy. I’m here to announce to the world that the Gluten-Free fad is OVER and gluten-free is now back with the people who medically need it. 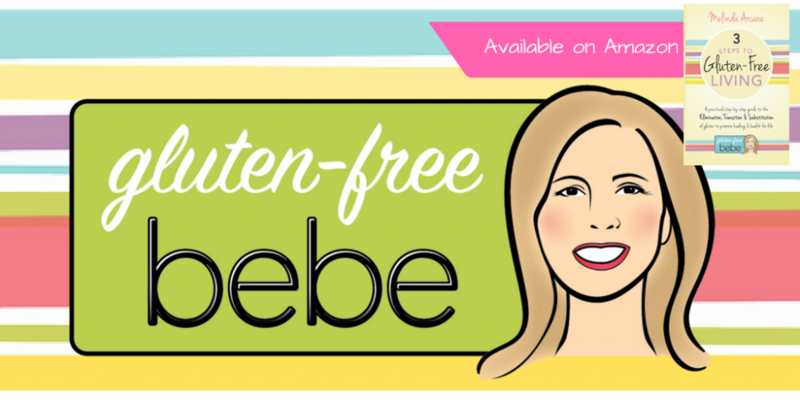 To learn more about my book go to http://www.glutenfreebebe.com or http://www.3stepstoglutenfreeliving.com. “Google.” Google search. 25 July 2016. Web search. 25 July 2016. “Celiac Disease, Non-Celiac Gluten Sensitivity or Wheat Allergy: What is the Difference? – The Gluten Intolerance Group of North America.” Web; 25 July 2016. <https://www.gluten.org/resources/getting-started/celiac-disease-non-celiac-sensitivity-or-wheat-allergy-what-is-the-difference/&gt;. Fugo, Jennifer. “How Ibuprofen (and Other NSAIDs) Lead to Gluten Sensitivity.”Gluten Free School. N.p., 17 Mar. 2014. Web. 25 July 2016. <http://www.glutenfreeschool.com/2014/03/17/ibuprofen-gluten-sensitivity-nsaid-drugs/&gt;. This entry was posted in Health Information, New to Gluten Free by Gluten-Free Bebe. Bookmark the permalink.